Ask a dozen different trainers a simple fitness question and you’re liable to get a dozen different answers, ranging from “You gotta take [insert name of supplement here], bro,” to a detailed lecture on the finer points of exercise science. Of all the advice, which path is really going to help you achieve your goal? The aim of this article is to give you the simplest, most specific advice to a variety of questions people who lift weights ask all the time. 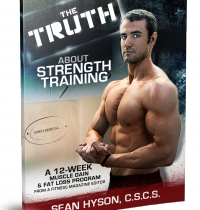 Cutting to the heart of complex training quandaries has been my business for the past decade as a fitness journalist, and it’s the theme of my new book, The Truth About Strength Training. So here are some of the most frequently asked training questions, and what I believe are the best answers to them, as provided by some of the best experts in the business (and me). Question 1: How can I bring up a weak body part? Answer: Schedule one workout per week to perform heavy, compound lifts for the muscle group you want to target. So if you want your quads to grow, you can do heavy squats on, say Monday. Then aim to work the quads with more joint-friendly isolation work the rest of the week. On Wednesday you could do some single-leg squats, and on Friday work on lunge variations. You only need to do two or three sets of higher reps for these exercises and can easily squeeze them into upper-body workouts or any other training you do on these days. If you want your chest to grow, do one day of benching and then work on pushups and flyes the rest of the week. Most importantly, train conservatively and give your body time to adjust. Only focus on bringing up one body part at a time. For example, trying to give both your chest and arms a boost at once will be too much to recover from (on top of your normal training). Question 2: How much cardio should I do to be lean? Answer: As I discuss in my book, most people can’t burn enough calories with conventional exercise to make a difference in their body fat stores. (Marathon runners and other endurance athletes who train for hours on end are the exception.) That’s why fat loss begins with nutrition. Cardio isn’t a must for losing weight, and if you’re a busy person who doesn’t know how he/she can fit it in on top of four days of weight training and every other responsibility in life, I say don’t worry about it. Just being active as much as you can—taking long walks, working in your yard, playing recreational sports, etc.—will burn extra calories and keep you in generally good condition (in addition to your weight training). However, with that said, cardio—be it low-intensity, steady state work, or high-intensity interval training—is, of course, healthy exercise and valuable to everyone. I just don’t look at it as essential for fat loss. To improve heart health, try to do at least three days of aerobic training a week, lasting 30 minutes to an hour, and another two days of high-intensity intervals. Aerobic work makes your cardiovascular system more efficient and can improve your weight training performance (it helps you recover between sets and between sessions). It’s also easy to recover from, so it can be used more frequently than high-intensity intervals, which demand a lot more from the nervous system, muscles, and joints. “I like to do long, slow cardio on off days to help recovery from lifting, and 10–15 minutes of intervals post-workout,” says Ben Bruno, a Los Angeles-based trainer to celebrities and athletes. What kind of long, slow cardio is OK? Jogging, cycling, swimming, and rowing are all fine. Anything that gets your heart rate up and keeps it up between approximately 120 and 150 beats per minute works. Prescriptions for intervals vary widely, so don’t worry about making them scientific. Just aim to work as hard as you can sustain for 10 to 30 seconds, and then rest (or lower the intensity to an easy pace) for as long as it takes to recover and repeat the exercise with the same high intensity. Coupled with a strict diet, cardio can help you burn off a little extra fat, but its main function is to improve the health of the cardiovascular system and conditioning for the sports or activities you might do. Use it as an adjunct to your weight training, and don’t think that more is better. Question 3: I’ve had a long layoff from the gym. How should I begin to train again? Answer: Very slowly. Your motivation is high right now, so you’ll want to push the pace, but that’s the quickest way to get injured and wind up back where you started. Remember that even though you’ve trained in the past, just a few weeks away from the gym results in detraining that reduces your fitness level. You may feel like you can pick up where you left off, but you’ll need to ease back in with lighter weights and simpler exercises than you may have left off with. Consider yourself a beginner. You may find that muscle memory kicks in and helps you make up ground quickly, but don’t expect too much of yourself too soon. Rest as little as possible between exercises and then rest 60 seconds at the end. Repeat the circuit for 3 to 5 total rounds. Plan to train three times per week—a Monday, Wednesday, and Friday schedule works well. As your conditioning and strength improve, you can experiment with more frequency and different splits, ultimately settling on a more specific goal and letting that determine your next step. Question 4: What is the best set and rep scheme for building strength and size? Answer: There isn’t one. But aiming for around 25 total reps on an exercise always results in a good blend of muscle and strength gains, says CJ Murphy, MFS, a powerlifter, strongman, and owner of Total Performance Sports in Everett, Mass. This is why the “5x5” protocol—5 sets of 5—is so popular. 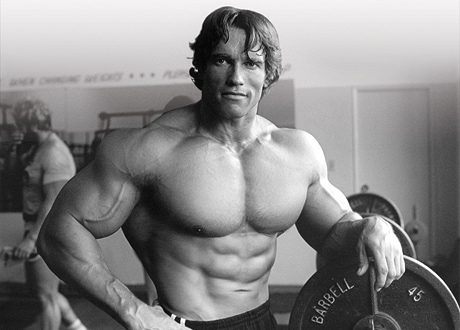 Arnold and his idol, Reg Park, made use of it for years. Apart from 5x5, 6 sets of 4 and eight sets of 3 also give you approximately the same volume. “That could be a weekly progression,” says Murph. “Do 5x5 the first week, then 6x4 the second week, 8x3, and repeat the cycle.” Keeping the reps on the low side means you can use heavy weights to stimulate the best strength gains. At the same time, a moderate to high number of sets ensures you get enough total work done to promote gains in muscle mass. Don’t go to extremes though: 12 sets of 2 would take a long time to perform, and would require such a heavy load you’d have trouble recovering. But again, the 25-rep rule is just a guideline. There will be periods in your training where you’ll want to use lighter weights and higher reps, totaling many more than 25 reps. Other times you’ll do very few total reps but go super heavy. Changing your program dramatically and regularly will keep you growing long-term—and The Truth About Strength Training discusses several methods you can use to avoid plateaus. Question 5: How do I train around a bad lower back? Answer: “Single-leg exercises allow you to load the legs without loading the spine as heavily,” says Bruno, so you may need to swap out barbell squats for Bulgarian split squats done with dumbbells, or single-leg squats. If you’re dead-set on continuing to squat, you could do front squats, which allow you to keep a more vertical torso and protect your lower back from shear forces on the spine. “If you’re deadlifting, trap bar deadlifts and sumo deadlifts will be easier on the back than conventional deads,” says Bruno. Rack pulls, where you shorten a deadlift’s range of motion by pulling from the pins in a rack, or from blocks, can also be substituted. Bruno also recommends replacing any bentover rowing movements with chest-supported rows (chest down on a bench) or inverted rows, where you hang underneath a bar in a rack and pull yourself up. Overhead pressing can be problematic, too, if your torso bends backward excessively. You can replace it with lever pressing, in which you wedge a barbell into a corner and lift the other end like a lever. To prevent future lower-back injury, you’ll most likely need to improve your hip mobility. Bruno likes to do squat stretches—get into the bottom of a body-weight squat and push your knees out to sink as deep as you can. “Core strength helps too,” he says. Work on planks, side planks, stability ball rollouts, and bodysaws.